PRINCETON, N.J. -- Democrats have become increasingly positive about Hillary Clinton since the highly viewed Democratic debate on Oct. 13. Her favorable ratings have increased from 72% for the two-week period just before the debate to 78% now, and her unfavorable rating has dropped from 23% to 15%. Clinton's resulting +63 net favorable rating is now her highest since Gallup began tracking views of the candidates daily on July 8, although still lower than measures taken before she became an active candidate last spring. Clinton's major opponent for her party's nomination, Vermont Sen. Bernie Sanders, has been increasing his attacks on Clinton in recent weeks, stating in a Boston Globe editorial meeting last week that "I disagree with Hillary Clinton on virtually everything," and increasingly focusing on her controversial actions relating to emails while secretary of state. But the trend in Clinton's image among Democrats provides no evidence that Sanders' attacks are causing her harm so far, particularly in contrast to Sanders' own image, which has been static since just before the Oct. 13 debate. Sanders' current net favorable score of +38 is a point lower than his +39 just before the debate. While the percentage of Democrats who are familiar enough with Sanders to rate him, 64%, is up slightly from the pre-debate period, this remains almost 30 points lower than Clinton's familiarity among Democrats. Sanders and Clinton, along with former Maryland Gov. Martin O'Malley, will face off in the next Democratic debate Saturday, Nov. 14 at Drake University in Des Moines, Iowa. As Gallup has seen at previous points in the campaign this year, Sanders' image is far worse among black Democrats than is Clinton's, as evidenced by his +21 net favorable among this group compared with +89 for Clinton. Sanders' weaker image score among black Democrats is partly a reflection of his lower familiarity rating -- 55% of black Democrats don't know enough about him to rate him. In contrast, 91% are familiar with Clinton, with almost all rating her favorably. The images of the two candidates are much more similar among white Democrats, with net favorable ratings within five points of each other. Sanders also does much better among liberal Democrats than among conservative and moderate Democrats, although Clinton's image is more positive than his among both of these groups. Sanders has a particular recognition problem among conservative/moderate Democrats, only 53% of whom are familiar with him, compared with 80% of liberal Democrats. 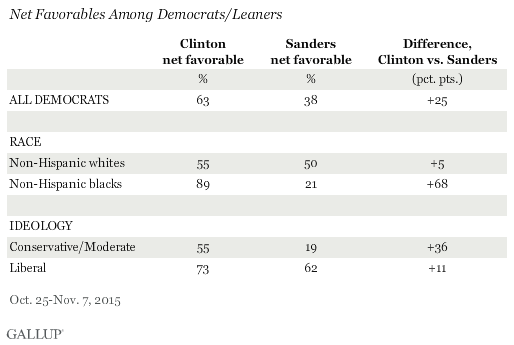 Clinton, by contrast, is known to over 90% of both ideological groups. Sanders continues to be both less well-known and less well-liked among Democrats than Clinton, his major opponent for the Democratic presidential nomination. Clinton has become even better liked since the Oct. 13 Democratic debate, while Sanders' image has remained essentially static. Sanders appears to be increasing his efforts to "go negative" on Clinton in recent days, and he and O'Malley will have an opportunity to confront her before a national audience on Saturday when the Democrats hold their next debate. This will be a difficult challenge, because over 90% of Democrats are familiar with Clinton, and a growing, and overwhelming, majority of them have a favorable opinion of her. Sanders also faces the challenge of increasing his own name identification, given that a good deal of his net favorable deficit compared with Clinton is a result of his relative lack of familiarity among Democrats. Now, 64% of Democrats know him, up from 49% in mid-July, but Clinton is one of the best-known politicians in America. If Clinton does win her party's nomination, she will face the challenge of improving her image among all Americans, which at this point is still "underwater," with 44% viewing her favorably and 48% unfavorably. This is slightly improved from recent weeks, but remains significantly less positive than before she became an active presidential candidate. Results for this Gallup poll are based on telephone interviews conducted Oct. 25-Nov.7, 2015, on the Gallup U.S. Daily survey, with a random sample of up to 2,971 U.S. adults identifying as Democrats or independents who lean Democratic, aged 18 and older, living in all 50 U.S. states and the District of Columbia. Hillary Clinton was rated by a random subset of 801 Democrats and Bernie Sanders by 764 Democrats during this period. For results based on these samples, the margin of sampling error is ±4 percentage points at the 95% confidence level. Hillary Clinton and her strategy team appear to want to make her quest for the Democratic presidential nomination seem like hard work with nothing taken for granted.